Every now and then, one comes across a book that makes you sulk when it comes to an end, like a kid who’s been denied ice cream! With Flames of Love I wished we could have had an extended epilogue, just so that we could have a few more minutes of Jaxson and Sugar, and of course Hamlet. I loved the introductory chapter and Jaxson and Sugar's meeting. From the initial introduction to these characters, one assumes that they are lighthearted, easygoing people. Nothing can be further from the truth. Their sense of humour has been honed from years of pain and survival, knowing that if they didn't laugh, they would cry. 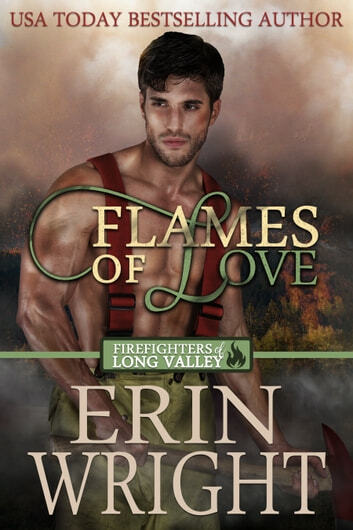 When Jaxson takes on the position of fire chief in the small town of Sawyer, he doesn't realise just how much prejudice and resentment he is up against. With half the town set to jeopardise his future, Jaxson knows that he has his work cut out for him. Nevertheless, among the bad eggs, there are some characters of sterling quality and with their help, Jaxson starts to make inroads into the problems facing him. Both Jaxson and Sugar have vows about dating, but in meeting one another, their rules begin to erode and crumble. They have more in common with each other than they first realise and with Hamlet playing his part, the couple find common ground. The one thing about getting close to another person is that it is difficult to continue keeping secrets. Sugar has been conditioned to believe the lies that have been told to her from the time she can remember, and she is therefore sceptical of Jaxson's acceptance. It takes a crisis to bring both of them to the place where they realise that together they can be stronger. This book is very well written and evokes the reader''s emotions without being mushy or patronising. Issues surrounding divorce are sensitively dealt with, however I would have liked to see Sugar receive the counseling she so desperately needed. I received a free copy of this book via Booksprout and am voluntarily leaving a review. Sugar is not a name most people would appreciate, but a name doesn’t delineate who you really are. In this case it was appropriately applied as she was as sweet as sugar. Her life was as gritty as sugar too but her life was warming up. A lovely read. Sugar and Hamlet are a team. Then Jaxson arrives in town in charge of the firefighting station. Follow their story as both make adjustments in their lives and Jaxson makes change in the small country town. A love story with a bit of excitement particularly when fire hits the bakery., will Sugar survive? A lovely love story. Flames of Love! Jaxson is what Sugar really need to find in a man. It was a fantastic romance story! It was hot how the sparks flew between them. I loved how some of the volunteer firefighters didn't take to well to Jaxson but the small town needed him and he needed the small town. I loved how the whole story was written, it was wonderful.